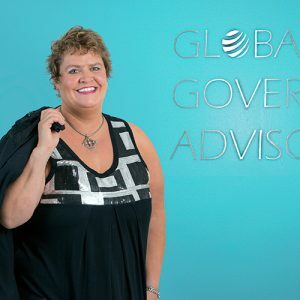 Arden Dalik is a Senior Partner in the Calgary office at Global Governance Advisors and is a leading expert in Executive Compensation, Governance, and Pay-for-Performance. She has been providing consulting advice to organizations across North America for over 25 years. Arden specializes in creating strategically aligned, creative, and competitive compensation solutions. She seeks to find the dynamic balance between an organization’s unique needs and the best interests and expectations of the shareholders. She has consulted to a wide variety of organizations including those in phased-growth industries (such as mining, oil and gas, and biotech). As a recognized expert, Arden has been asked to lecture across North America on Board, Committee and Executive Governance and Assessment as well as executive and director compensation and strategy alignment. She is also regularly featured in the media providing insights into such areas as Say-On-Pay and Board Diversity. Arden spent 12 years with Mercer Consulting where she led the Canadian Performance and Rewards practice. While at Mercer, Arden was a member of the North American compensation team responsible for the development of their Competency-based programs and Global Compensation for multi-nationals. She also spent 8 years with Shell Canada in a variety of HR roles. Immediately prior to joining GGA, Arden worked in affiliation with the Wynford Group as VP and Executive Compensation Practice Leader, and was a founding partner of Raintree Consulting. Arden writes frequent articles on Board and executive compensation and governance issues. She has written for HR Reporter, the Calgary Herald, World at Work, Queens University IRC, and numerous other national and international publications. Arden is a member of the Institute of Corporate Directors, and serves on numerous not-for-profit Boards of Directors. She is also a part of the teaching faculty for the Accredited Executive Compensation Program (AECP). Arden graduated from the Faculty of Business at University of Calgary (Bcomm).